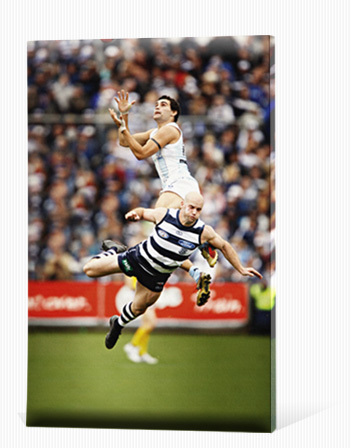 Turn your favourite footy photo into a work of art! Made from a quality blend of cotton and polyester, the stretched canvas is that extra special gift. Your selected image will wrap around the edges of the canvas frame and a special UV finish ensures the canvas is protected from any sun and moisture damage. Canvases are delivered to your door ready to hang, with plastic coated stainless steel soft-strand wire anchored on either side of the rear of the frame with D-rings. The canvas is available in three popular sizes: 8x12 inches, 12 x16 inches and 16x20 inches. All canvases are delivered in crush-proof packaging within seven working-days of ordering.